Gesar Mask by Katie Haggerty. Gesar of Ling, one of the four main ancestral sovereigns of Shambhala, represents the quintessence of the Tibetan warrior tradition—an enlightened being who took birth as a Buddhist warrior king to defeat the enemies of the dharma. 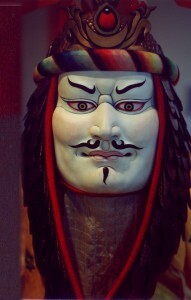 He is both guru and protector, as well as the ancestral spirit of the Mukpo clan. As the Vidyadhara Chögyam Trungpa Rinpoche explained, “Warriorship here refers to realizing the power, dignity and wakefulness that is inherent in all of us as human beings. It is awakening our basic human confidence which allows us to cheer up, develop a sense of vision and succeed in what we are doing.” In this context, the meaning of warriorship transcends any idea or expression of aggression. While our Shambhala texts themselves barely mention Gesar by name, they are replete with the imagery and teachings found in The Epic of Gesar, the largest existing oral epic in the world. Within the epic, discussions on windhorse (lungta), authentic presence (wangthang), enriching presence (yang), confidence or dignity (ziji), and the principles of lha, nyen, and lu abound. The Vidyadhara explained that “we can regard the entire story as a display of how the warrior’s mind works. Gesar represents the ideal warrior, the principle of all-victorious confidence. As the central force of sanity he conquers all his enemies, the evil forces of the four directions, who turn people’s minds away from the true teachings of Buddhism, the teachings that say it is possible to attain ultimate self-realization.” References to warring, frequent in the Gesar literature, also appear in the Shambhala texts where the enemies of the dharma, the evil forces of the four directions, are nothing other than the personification of our own internal battles. At the first Kalapa Assembly in the fall of 1978, during one of our translation sessions with the Vidyadhara, Larry Mermelstein engaged him in an interesting discussion about the nature of the Shambhala texts he was presenting to us. When asked whether they were terma (“treasure teachings” hidden long ago to be discovered at an appropriate time in the future), he replied, “Yes, sort of.” When we asked whether we should include the terma mark to indicate terma in our translations, his response was, “Not yet; maybe later.” In fact, this did not come to pass until after his death, when Dilgo Khyentse Rinpoche instructed us to include this in our future publications of these texts, and he confirmed with no hesitation that they were indeed authentic terma. During the visits of His Holiness the Sixteenth Karmapa and Dilgo Khyentse Rinpoche in the ’70s and ’80s, at the Vidyadhara’s request the Shambhala community received various empowerments of Gesar of Ling. As a community, we practice “The Long Werma Lhasang, called The Warrior Song of Drala,” which was composed by Mipham Rinpoche. This is a purification ceremony using juniper smoke to invoke Gesar as the embodiment of basic goodness, which we do to commence important Shambhala holidays and gatherings. 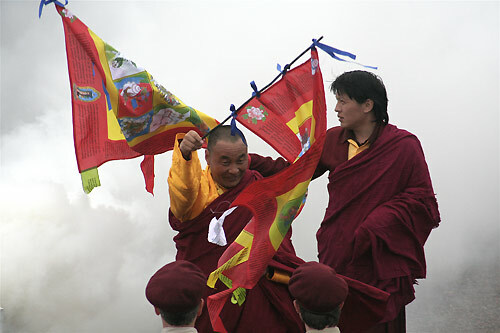 After the Vidyadhara’s death, the Gesar protector chant, also written by Mipham Rinpoche, was introduced by Dilgo Khyentse Rinpoche and was first practiced by the leadership of the Dorje Kasung. With the marriage of Sakyong Mipham Rinpoche and Semo Tseyang, the presence of Gesar of Ling is becoming even more evident in our community. Their wedding ceremonies in Halifax this year introduced us to Namkha Drimed Rinpoche, father of the bride, and a well-respected Nyingma lama and tertön (revealer of treasures), who receives terma specifically about Gesar. The wedding events included an enriching empowerment of Gesar of Ling, bestowed by Namkha Drimed Rinpoche from among his own termas. At the conclusion of the empowerment, he also conferred the reading transmission for a Gesar supplication that the Vidyadhara had composed in Tibet at his request, as well as a short Gesar biography written by Dilgo Khyentse Rinpoche. This Gesar text by the Vidyadhara, entitled The Ocean of Play of Buddha Activity: A Daily Supplication to the Warrior Gesar, the Great Being Döndrup, King of Werma, Tamer of Enemies first came to our attention in the fall of 1994. The Sakyong, traveling with a small group, met with Penor Rinpoche at Namdroling monastery in southern India in order to prepare for the Joining Heaven and Earth ceremonies the following year. At that time, several of us received the reading transmission of this text from Lama Pema, a very old man from the Tsawa Gang region of Kham, home also to Lady Könchok Paldrön, the Sakyong’s mother. Two years later, we received another edition of this text when Namkha Drimed Rinpoche was present at a teaching program conducted by Thinley Norbu Rinpoche in California. This provided the impetus for Robin Kornman (our own Gesar expert), working with Lama Chönam and Sangye Khandro, to prepare an initial translation. But much work remained, and it was hoped that we would be able to review this text with Namkha Drimed Rinpoche, who had originally requested the text in 1958. 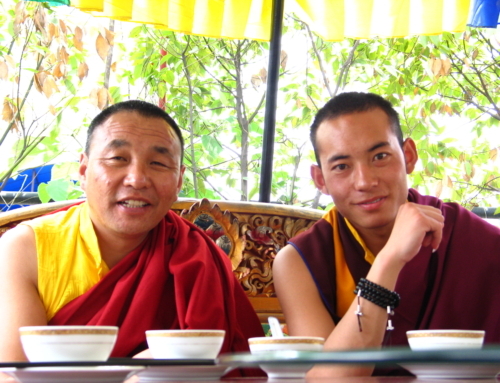 This June, we were able to meet with Namkha Drimed Rinpoche, along with his son Gyetrul Jigme Rinpoche, and review Robin’s translation in some detail. We had additional meetings with Lama Ngodup Dorji in July and with Jigme Rinpoche during his second visit to Halifax in early August. 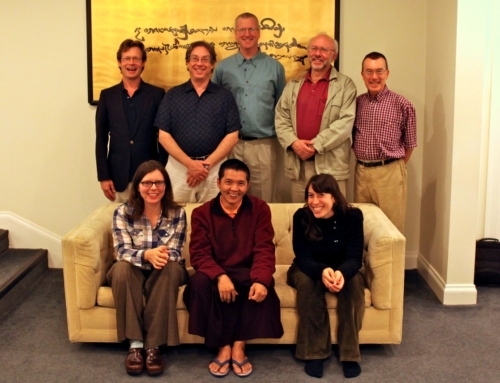 Of course, these teachers of the Gesar tradition were all immensely helpful and knowledgeable, and we look forward to working together in the future. Meeting with Namkha Drimed Rinpoche and Jigme Rinpoche in Halifax. Photo by Marvin Moore. In July and August of 1958, I attended the Rinchen Terdzö empowerments that Trungpa Rinpoche was giving at Yak monastery in Tsawa Gang. That was the first time I met Trungpa Rinpoche. I already had a very personal connection with Gesar. 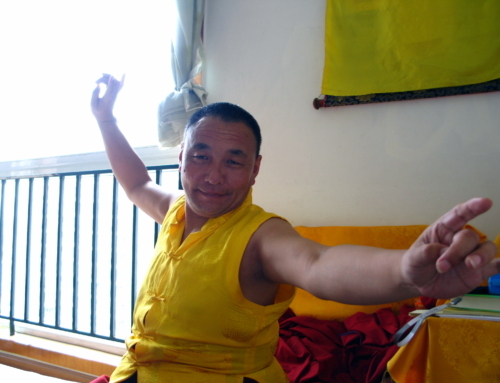 I had received some Gesar terma teachings, but they were not complete. Realizing that Trungpa Rinpoche was a great master and also had a very special connection to Gesar, I asked him to write something for me. He immediately wrote down the Gesar supplication, The Ocean of the Play of Buddha Activity. After the text was copied, he sealed the original and presented it to me. Trungpa Rinpoche took the route along the Kongpo mountain range and eventually escaped through the region of Pemakö. I followed the water route, which was easier but longer, because there were more old and infirm people in my group. At one point, we were captured by the Chinese. As we were dressed as ordinary lay persons, no one could tell who was a lama or a leader. For some reason, the Chinese left my family alone, but sent everyone else back to Kham. This was truly a miracle. The fact that my entire family was able to escape together was only possible through the grace, power, and blessings of Gesar.